Transition to a Zero Emissions Economy in 10 Years? Not only is it possible for Australia to become a carbon-free economy, but it is possible using affordable technology that already exists. In early 2009 the volunteers at Beyond Zero Emissions set out to create a road map to take Australia from one of the largest per-capita greenhouse gas producers to a zero carbon emitting nation within 10 years – a timeline aimed at decreasing the likelihood of devastating climate change by limiting the global temperature rise to 2C. Fortunately Australia has abundant wind and solar resources we can use to supply the energy needs of the country. Beyond Zero Emissions calls for replacing all carbon emitting energy sources with clean, renewable supplies coming primarily from the sun and the wind. One of the key technologies in this transformation is Concentrated Solar Thermal with Storage. 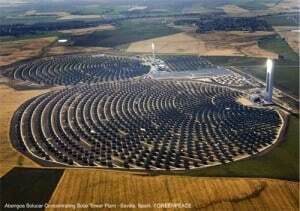 A CST power plant works much the same as a coal-fired plant, except the heat to produce the steam to spin a turbine comes from the sun rather than burning coal. In CST with storage, a field of mirrors directs the sun’s energy at a tower, where it raises the temperature of molten salts. The hot molten salts are stored in a thermal tank (essentially a large thermos) until needed to drive the turbine. CST with storage not only is clean, but electricity supply can be quickly adjusted to meet variable demand. Coal plants take a long time to heat up and cool down and therefore tend to produce constant power day and night. It also makes it a flexible compliment to intermittent renewable energy sources, such as solar photovoltaic and wind. Wind power is the other major provider of energy in BZE’s Stationary Energy Plan. Wind is the cheapest form of renewable energy and can be generated for around 10 cents per kilowatt-hour (coal is ? 17c?/kWh – not including health and environmental costs). The main drawback to wind power is that sometimes there is wind, and sometimes there is not. By spreading out the locations of wind turbines the supply can be more consistent, and pairing wind with CST with storage meets the majority of our predicted electricity demand. Other renewable supplies, such as existing hydro and biomass are able to meet the remaining demand. In BZE’s plan, wind is earmarked for the tablelands near Atherton. Both Wind and Solar Thermal have relatively high ratios of Energy Returned on Energy Invested (EROEI), and by some estimates our energy supplies need to have an EROEI of 3-5 or greater to sustain our modern lifestyle. In a 2012 article by Prof. Frank Kreith from the University of Colorado at Boulder estimates that the average EROEI of wind systems in 1999 was 23 and continuing to increase. Solar thermal has an EROEI of 10 or more. Fossil fuels historically had high EROEIs, but as oil production is becoming more energy intensive it has dropped to as low as 3 for tar sands, and coal’s EROEI decreases as more carbon abatement is added to the process. The Zero Carbon Australia Stationary Energy Plan is available for free download from BZE’s website at bze.org.au. It is the first of a series of reports – the transport, land use and buildings plans are all expected to be released later this year. They provide a technically sound and financially viable road-map to taking Australia to a 100% renewable economy within 10 years. Locally you can find out more or get involved by contacting the Cairns Climate Action Network at CairnsCAN@gmail.com or our Facebook page Cairns Climate Action Network – CCAN.